Yikari is monk NPC for BGII. In Shadows of Amn, he can be found in the Temple District in Athkatla and may be be summoned by the Throne of Bhaal Fate Spirit. This mod provides good characters a roleplaying reason to get Celestial Fury. Yikari's quest is to retrieve the sword, and return it to its rightful owner and location. 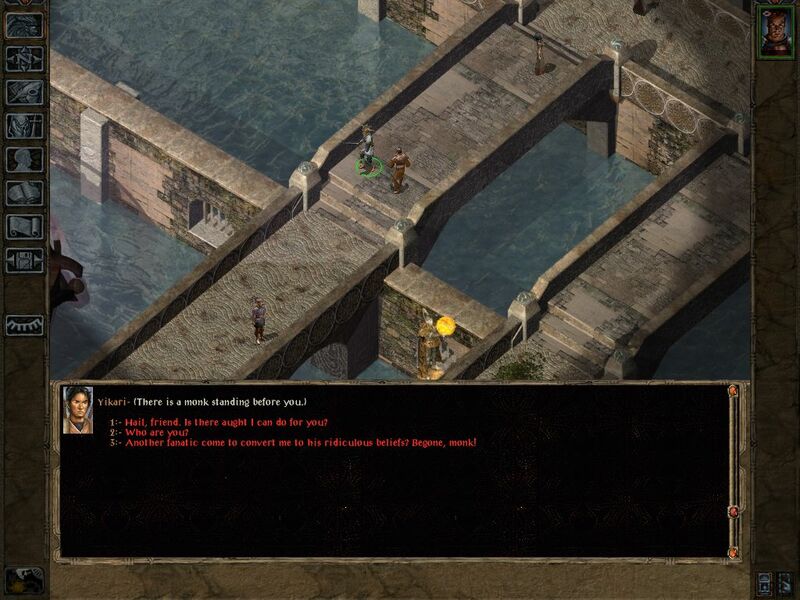 Whether or not the player already has the sword at their first meeting affects Yikari's equipment, biography, and dialogue, for Yikari has taken a vow of silence until he found has the sword. Once the party gets Celestial Fury, he can be persuaded to stay in your party. Under normal circumstances, he will keep the sword for himself, and not allow the PC to use it. Charismatic PCs can persuade Yikari that another character should wield Celestial Fury (Yikari must be in the party, however).